The double objective of the EPA Plaine du Var is to preserve the area’s ecological capital, demonstrating that economic development can be achieved while respecting local biodiversity. Environmental concerns are at the heart of the Eco-Vallée operation, conceived as a test best for the policies agreed upon during the Grennelle Environment sessions, Grenelle 1 (August 2009) and Grenelle 2 (July 2010). The objective is to enable a deep change in the methods applied in urban planning in order to optimise the use of space throughout the territory, limiting the urban development and preserving the natural setting. The strategy adopted at local level is in line with the national action plans in terms of sustainable development, climate change, health and environment. • The special protection zone of the lower valley of the Var (642 hectares), within the river bed, which is classified as bird conservation area. 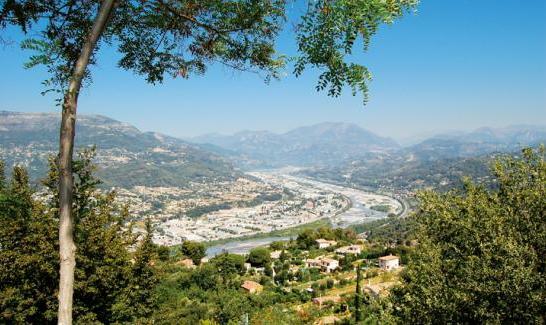 • The smaller adjoining valleys of Nice and Saint Blaise (453 ha), which form remarkable shady, humid zones, that are home to a range of species. The protection of water resources is essential for the city of Nice : 600 000 inhabitants depend on the river and the groundwater table of the Var for their daily water consumption. Vulnerable to pollution, this resource is very sollicited, for both industrial and agricultural purposes. For the French Riviera, the Eco-Vallée symbolizes a deep mutation in its urban planning. Turning its back on a development which has, in the past, too often spoiled the landscape, the goal is now to cherish and preserve the area’s natural assets, while enabling an essential growth in terms of jobs and housing. As such, this operation aims to deploy a responsible urbanization, where natural spaces and agricultural zones are fully integrated in the overall project, as breathing areas between urban districts. An eco-exemplary valley means that energies will be diversified as well, and the carbon footprint closely monitored. The State has recognized the pioneering spirit of this operation by selecting, within a national call for projects, the Southern part of the Var valley as one of the thirteen French EcoCités. Reconciling industry and ecology isn’t a mere utopia : The Eco-Vallée is set to become a laboratory for industrial ecology. The goal is to reduce the environmental impact of the activities of over 10 000 companies, in the sectors of manufacturing, construction, transport and commerce. The Carros-Le-Broc industrial zone has already put in place an exemplary approach for its waste management. All contracting authorities, private or public, are requested to aim for environmental excellence within the EPA’s framework document entitled : « Cadre de référence pour la qualité environnementale de l’aménagement et des constructions » “Framework of reference for the environmental quality for development and constructions ». Whether it be a matter of proposing positive energy buildings, or of respecting the significant percentage of greenspace, the selection of promoters will be based on their capacity to place environmental issues at the heart of their project. How to ensure the protection and restoration of the area’s biodiversity? Stakeholders will find key answers in a biodiversity guide produced by the EPA and entitled: « Guide pour la prise en compte de la biodiversité et des fonctionnalités écologiques dans l’Eco-Vallée » Guide to help take into account the biodiversity and ecological functionalities within the Eco-Vallée, a document recognized for its innovative approach, both at National and European levels. Based on a number of studies, this tool box offers concrete solutions. It explains for instance how to improve the ecological corridors, based on the model of the natural park of the riverbanks of the Var , how to recreate missing connections, by restoring, for example, the junction with the canal, how to combine urban development and biodiversity by integrating natural settings within the city planning.